Beautifully updated unit on ground floor with handicap access. 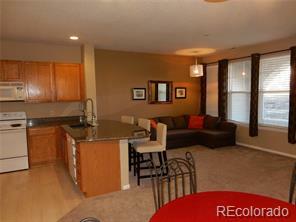 Open floor plan with new carpet, paint, granite counter tops and tile flooring. Great set up for entertaining. Quiet nights you can sit outside on the covered porch and watch the world go by or cozy up in the living room in front of the fireplace. It's a comfortable house you will be proud to call home. Located in the Cherry Creek School district. Close to shopping at Southlands Mall and the golf course. Move in ready. All appliances stay, including the washer and dryer. Come and see this beautiful home today!